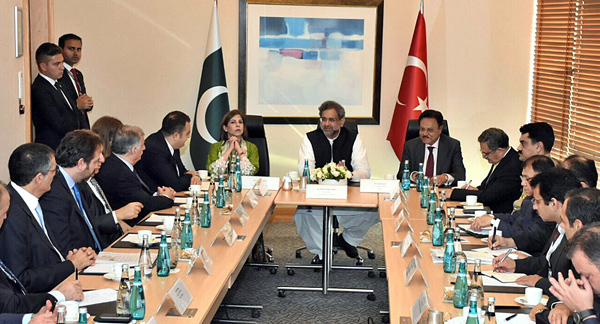 ISTANBUL , Oct 20 (APP):Prime Minister Shahid Khaqan Abbasi on Friday invited the Turkish entrepreneurs, business giants and mega companies to invest in diverse areas of economy in Pakistan, especially hydel and coal power generation in energy, mining, banking and infrastructure development. The prime minister expressed these views during a meeting with Foreign Economic Relations Board of Turkey (DEIK) here on the sidelines of 9th D-8 Summit. Top leadership of major Turkish companies including Albayrak, Zorlu, STFA, Arcelik, Siyah Kalem and Cagri Makina were also present in the meeting. Mentioning the investment in Pakistan by some Turkish companies present in the meeting in the areas of infrastructure, transport, beverages and electronics, he said, Pakistan would welcome more companies to invest in diverse areas. The prime minister said joint ventures in textiles were also viable option as Pakistan had abundant cotton production coupled with a well-trained labour force. “Pakistan is open for business. It values your investment and has an excellent record of profitability,” he added. Giving a snapshot of country’s economy, the Prime Minister said Pakistan – a nation of 200 million people with a growth rate of 5% and abundant skilled and semi-skilled young labor – was one of the most liberal economies of South Asia at the crossroads of Middle East, Central Asia, South Asia and East Asia. He also mentioned the challenges the PML-N government inherited in 2013 like large fiscal deficit, rising debt burden, unfavorable balance of payments, low foreign exchange reserves, flight of capital, weakening exchange rate and perilously declining investor confidence. Prime Minister Khaqan Abbasi, however, maintained that with prudent economic measures taken by the present government since 2013-14, the economy has witnessed a smooth upward trend in the growth rate and the real GDP growth which was above 4% in 2013-14 had increased to 5.28% in 2016-17, the highest in ten years. With agriculture meeting its growth target of 3.5% in 2016-17, he said, the services sector grew at 5.8% and revenue collections increased from 8.7% in fiscal year 2013 to 10.7% of GDP in fiscal year 2016. The prime minister said Pakistan’s ranking in the World Bank’s Ease of Doing Business index has improved and the country has been recognized as one of the top ten performers globally in the area of business regulation. With Public Sector Development Program (PSDP) allocations going up to Rs. 800 billion in 2017 from Rs. 384.3 billion in 2013, Pakistan Stock Exchange was ranked the best in Asia and 5th best performing stock market in the world in 2016 by Bloomberg, he added. He reassured the Turkish entrepreneurs that the government would continue to provide them with the maximum facilitation and support. The Turkish companies expressed their keen desire to take advantage of the conducive business environment and investment friendly policies of Pakistan. The prime minister also had a separate meeting with the top management of Zorlu Energy, Turkey . Zorlu Energy has already invested 300 MW in the Quaid-e-Azam Solar Power Park.